When I was in Iceland I had an intense personal experience, shared with several friends, which later had me reassessing the way that I approach celebrating holidays and the entire cycle of holy days in the year. This has led me to trying an experimental year where I am celebrating times that are especially in sync with the Pleiades because I believe these times are more important to the Othercrowd than I had previously realized. The first of these dates was on yesterday, 21 November, a time when the star cluster culminates or is at its highest point in the sky at exactly midnight. I had designed a ritual to honor this specific time which I had share don my Patreon recently. Last night I went out and celebrated it. Going out under the November sky last night in America was strongly reminiscent of being out at night in Iceland for me. It was unusually cold and windy, the air having that sharpness that it gets when the temperature is a good amount below freezing. I had intended to make offerings of honey cakes which I have used before on major holidays but there was an odd amount of apple synchronicity going on during the day so after some divination work I ended up making an apple spice cake instead. There seemed to be a very strong apple theme all around which is something I will certainly keep in mind next year. As it was I moved out into the darkness of the late night carrying fresh water and apple cake to offer, searching the sky for the blue glow of the Pleiades. Since the full moon was also high in the sky I had some trouble finding the stars but I did eventually locate them and I set up in what I felt was a good spot. I cast my compass using some of the water, not for protection but asking that the way between worlds be opened. I spoke the beginning portion of the ritual, inviting in the Otherworldly powers, and froze as the sound of bells and uncanny music floated on the wind. 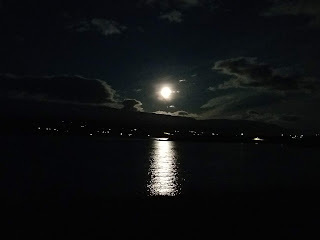 It was unnerving; the last time I'd heard anything like that when the Slua Sidhe was nearby and I can't quite put into words the way it makes you feel terrified and thrilled all at once. I stood my ground and went on to the next part trying to ignore the sound of shuffling footsteps in the leaves around me. After that section I did pause again to make sure there weren't any animals nearby as I wasn't eager to be surprised by - or surprise - any local wildlife. Suffice to say that it wasn't wildlife making the noises so I continued on with the rest of it. At the very end as I was closing up there was a particularly large gust of wind then everything went very still. It felt good in that moment, the whole ritual felt good if a bit wild and certainly eldritch in the old sense. My husband would tell me later that while I was outside our entire house shook in a way that made him think a branch had fallen on the roof although there was no accompanying noise with it and no damage or sign of anything amiss today. I had strange dreams last night and today has been an interesting day overall but again nothing bad just a bit more intensely Otherworldly than usual. We are finishing out our new holiday celebration with a feast incorporating apples in as many ways as I can manage. Some of this will also be left out as an offering of course. Overall I feel that this was successful and intend to celebrate it again next year. Now I will start thinking about what the next logical holy day would be and how to approach that one. A friend turned me on to your posts over on Patreon about working on this ritual year. It sounds very interesting! Have you any idea why the Pleiades are so important to the Other and what they represent? I know they are the Seven Sisters and I've seen it suggested that they are maidens or birds (the Seven Whistlers) who are hunted by the Hunter. Even that they are the seven piglets of Twrch Trwyth who are hunted my Arthur, which leads me to wonder if an earlier mythos they were hunted by Gwyn ap Nudd. Very curious, even more reason to read the Morrigan!